well i have a 10 month old female pit named jordynn.. she is great with everything from kids to other animals. 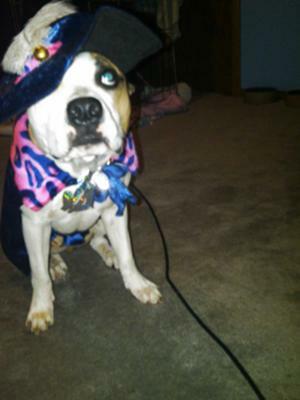 she is the biggest scardy cat for a pitbull. i never saw one as big of a sissy as mine..
i got her costume when me and my girlfriend were lookin around at halloween stores. 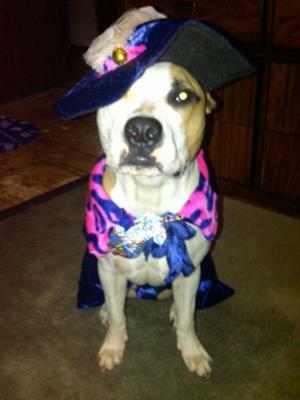 i wanted her to have a lil witch costume but i dont know something about the pimp one just made me laugh so hard when i imagined her in it.. and once she had it on it was too cute..
i think jordynn should win because she is one of the greatest exapmles for the pitbull breed because you can do whatever you want to her and she won't bite or do anything to you but give everyone kisses.. that's all she wants todo. so please pick jordynn.